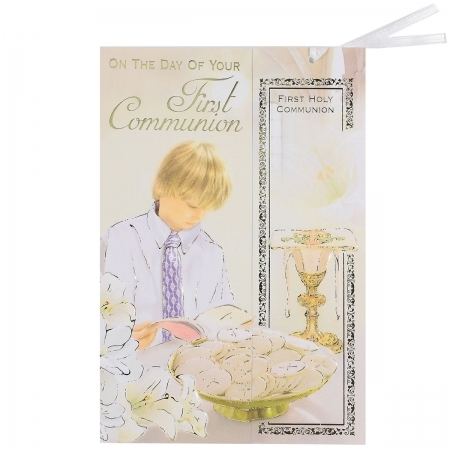 This First Communion card for boys is nicely printed in gold letters and contain many Communion symbols. Inside the card reads "With a special prayer to God for His Blessing on your First Communion Da. May He always guide you along your future way". Size of the card is 10cm (width) by 22.5cm (height). The right side of the card is detachable and turns into a bookmarker. Back of the bookmarker contains a Communion Prayer. Supplied in a protective transparent wrapper.